Preheat oven to 170c/340f and line a baking sheet with parchment paper. 1.Make the macaroon batter: In a large bowl, stir with a spatula the ingredients. Stir until the ingredients are completely combined. 2.Scoop the batter: Scoop the batter on the baking sheet. Use ice cream scoop. 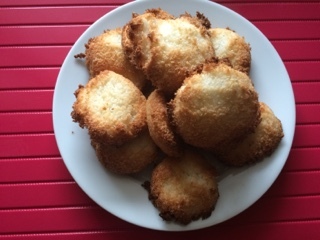 4.Cool the macaroons: Let the macaroons cool on the baking sheet for 5 minutes, then transfer to a wire rack to cool completely. Macaroons can be kept in an airtight container for up to a week.